Book an experienced Sound & Vision DJ to provide the perfect sonic experience for you and your guests. The fine art of DJ 1Solo AKA Walter McDavid is an experience. 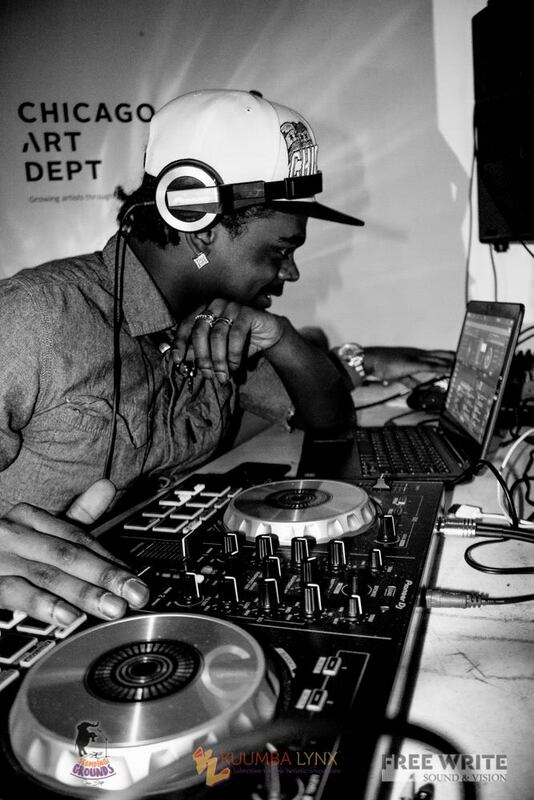 DJ 1Solo, born and raised on the Southside of Chicago, is creating art in a genre-jumping way. From hip-hop to alternative rock, and house to the club. 1Solo started to hone his art in February of 2008 when his lovingly named older brother Mario Williams (AKA DJ Skyrockit) came over to chill and practice. 1Solo started DJing with Virtual DJ and music his mother and step father had on CDs. His blending and timing improved quickly and by his 13th birthday in 2008 he was DJing family events and house parties. He grew and started to do gigs at his elementary school and house parties around the neighborhood. August 2 2011 he was detained and met Free Write's Ryan Keesling and Elgin Bokari. They pushed his art and drawing skills ‘til one day 1Solo spoke with Ryan about turntables and DJing. Soon after he was coming to the program practicing and honing his scratching and mixing skills while broadening the types of music he listened to. Before leaving the detention center, he DJed for a Louder Than A Bomb event giving him a new experience and more of a love for this fine art. Once out, he went back to school and joined the DJ club working with mixers and speakers his senior year. DJ 1Solo soon started to tag along on more explicit gigs with his older brother, hitting up clubs and hookah lounges and being thrown into the fire. It made him better and helped him to hone his art even further. DJ 1Solo found Ryan on social media and it wasn’t long ‘til he was working for Free Write Sound & Vision as a DJ and Audio technician. Itunuoluwa Ebijimi (aka Petty Crocker aka The Wife of Wrath) is an interdisciplinary artist, performer, and shea butter entrepreneur based in Chicago, Illinois. She is the current sole owner and operator of “Petty Butter,” an all natural skincare line featuring shea butter mixes, blacksoaps, and more. Ebijimi’s art and business integrate mediums such as photography, fashion, and deejaying/performance with cultural histories of west-Africa/ the Afro-diaspora, holistic beauty practices, and decolonial theories. Elgin Bokari T. Smith, best known as L O Kari, is an Uptown Chicago Dj, Activist, and Visual/Performing Artist from St Louis Missouri. Born in 87, L O Kari was heavily influenced by the soulful sounds of RnB, Jazz, Hip Hop, Gospel, and alternative rock. While attending Central Visual and Performing Arts High School in St. Louis, Elgin discovered he had an ear for music and began creating music on both the piano and guitar while adding his own unique flavor. Now known as L O Kari, Elgin has traveled to perform in New York, St. Louis, Ohio, Seattle, South Korea, Japan, and all over the Chicagoland area. He has shared stages with Bone Thugs and Harmony, Ruby Ibarra, The Terra Godz, Saba, Da Brat, Clark Airlines, Mega Ran, Bop Alloy, No Name Gypsy, DJ Esco, Young Chop, Lil Crazed, Rebel Diaz, Twista, and Chingy-- just to name a few. L O Kari’s style is smooth and transformative as he is known to blend together mixes of Hip hop and RnB, to Electronic, Trap and EDM. Some of his influences include, Michael Jackson, Stevie Wonder, Nujabes, Linkin Park, Joe Hisaishi, LORN, and Prince. What is most notable about his style is his ability to adapt to the vibe of the audience he's serving. Elgin also gives back to his community as a teaching artist through his artist collective Elephant Rebellion where he serves as president. A ubiquitous figure in the Chicago DJ community, Ryan Searchl1te puts down vibes that both tantalize and satiate listeners and dancers in the vicinity. With particular roots in Jungle, Funk, Soul, Hip Hop, Reggae, and Global Bass music, Ryan traces the common threads between sounds, people, culture, and time. Ryan's productions are loaded with his own field recordings, samplings from a nerdy collection of vinyl, analog grit cranked out of piles of old gear, and collabs with the underground’s toughest lyricists and musicians. Ryan is also a music educator, co-designing creative spaces with Chicago's incarcerated and court-involved youth.